It Swims. It Squirts Water. It’s Robo Fish! Students collaborated all year on projects for the mechanical engineering senior design course. Here’s one of them. A student team spent the fall and spring semesters writing code, soldering wiring, and crafting and waterproofing parts from shape-memory alloy—all to get a robot fish to swim and squirt water. The result might sound like little more than a high-tech bathtub toy. But this robot fish project, led by Alex Brown, assistant professor of mechanical engineering, could help deepen our understanding of the brain and how to use its secrets to advance our own technology. 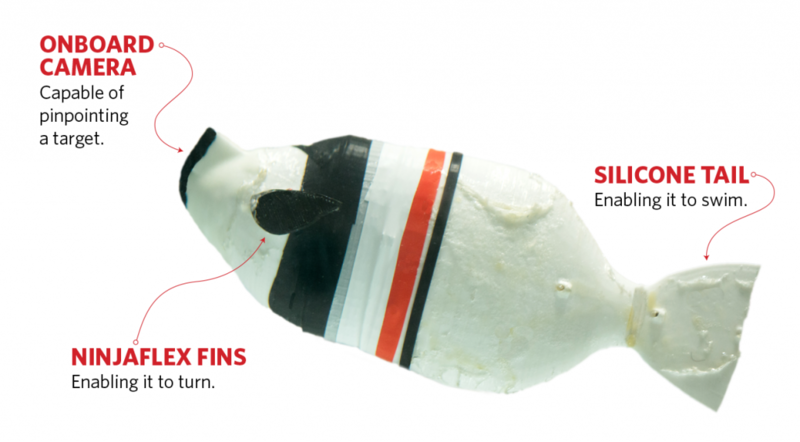 Lafayette’s robot fish—a black-and-white tube made of bendable NinjaFlex and silicone—is an artificial archerfish. Its biological counterpart is silver with black stripes. It swims in estuaries and mangroves in India, the Philippines, and Australia. 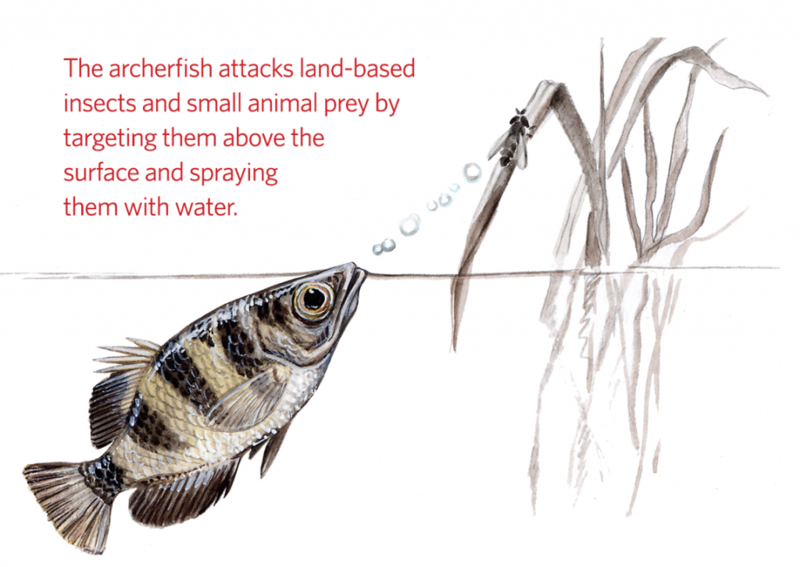 The archerfish attacks land-based insects and small animal prey by targeting them above the surface and spraying them with water. Brown first got the idea for his aquabot while watching a nature show on TV. Researchers, Brown learned, have discovered the archerfish can nail moving targets—some traveling as fast as a foot per minute. And, what is more interesting, archerfish can develop their shooting ability by watching their fish friends. One experiment Brown learned about separated a group of archerfish into two schools. One group learned how to shoot moving targets by practicing. At first, these young archerfish weren’t so good aiming at darting, shoreline objects, but by the end of a day of practice, they were able to hit targets outside their tank about 60 percent of the time. The second group was separated from the first by a glass barrier. They watched the other archerfish. Later, this inactive school had its chance at the moving targets. Despite no rehearsal, its success rate at shooting targets was nearly the same as the school that had practiced the day before. “That’s as if you were watching someone make three-point shots all day, and all of a sudden you get there, and you can just do it,” Brown says. Brown was fascinated. At a holiday party, he hooked his father, a Villanova University psychology professor, and they set out to see what they could learn from the archerfish. The two obtained archerfish and put them in a tank at Villanova. Brown handled the tackle box of needed gizmos. He built a shooting gallery for fish that moves tiny targets around the tank. Villanova’s archerfish learn by shooting water at the targets as food is released. He installed the gallery on a 125-gallon tank at his father’s university, where four to eight archerfish at a time use it for target practice. Brown figured he’d build his robot on his own—a trial-and-error job that would take him the next few years to complete. But during the fall 2016 semester, when his students told him they wanted to build a biomimetic robot (a robot that mimics an animal) for their senior capstone project, the archerfish just seemed to fit. “There is absolutely no reason to believe that a team of undergraduates could do something like that,” he says. “It’s a huge risk and a huge lift.” After all, there are so many variables. How will the fish swim? How will it perceive its target? How will the mechanism stay water free? I said to them … if you’re willing to take that risk and give it a shot, then I fully support you, so that’s what they did and they got very, very close! He’s speaking in one of the mammoth labs on the first floor of Acopian Engineering Center just before spring semester finals. Seniors are rushing to put the final touches on a race car, a synthesizer, a mechanical prosthetic finger, and a refined EpiPen. His own team hurries past him cradling fish tails that seem made of candle wax. Dan McLaughlin ’17 types code into a computer that makes a camera in a rubbery fish head pinpoint a target. When the fish’s aim lands, an electrode powers an LED light. Later, the light will be replaced by a water pump designed by Rachel Paisner ’17 and Sarah Shoop ’17 that sprays the mechanical fish’s liquid ammunition. It’s not perfect. The most complete version of the robot archerfish—one that swims with its silicone tail, turns with its Ninjaflex fins, sites a target with a small camera, and fires a jet of water at it—couldn’t accommodate all the bells and whistles at less than a foot. That’s too big for an archerfish. “But that’s kind of a small concession for having a fish that does all the things that we ask,” Brown says. The team sat in on conference calls with Brown’s father in Villanova to determine exact specifications for the fish. Shannon Hurley ’17 used a paper about the morphology of archerfish to design the robot, which has fins designed by Toussaint Helm ’17 and Alex Alford ’17 and terminates in a shape-memory alloy actuated tail designed by Paisner and Duncan Sparks ’17. A student team spent the fall and spring semesters writing code, soldering wiring, and crafting and waterproofing parts from shape–memory alloy—all to get a robot fish to swim and squirt water. Duncan Sparks ’17 helped design the fishbot’s shape-memory alloy actuated tail. To manufacture a tail, Hurley cordons off a section of table in the Acopian lab. She dips silicone from a bucket of dish soap and water used for curing the substance, which she pours into a fish-tail mold she crafted using a 3-D printer. “We let it dry for a day or so,” she says. Tom Cangialosi ’17 and McLaughlin wrote the code that allows researchers to control the swimming wirelessly. It can swim using its tail and turn at various speeds. Until they add their bot to the tank in Villanova, there’s no telling whether it will succeed. 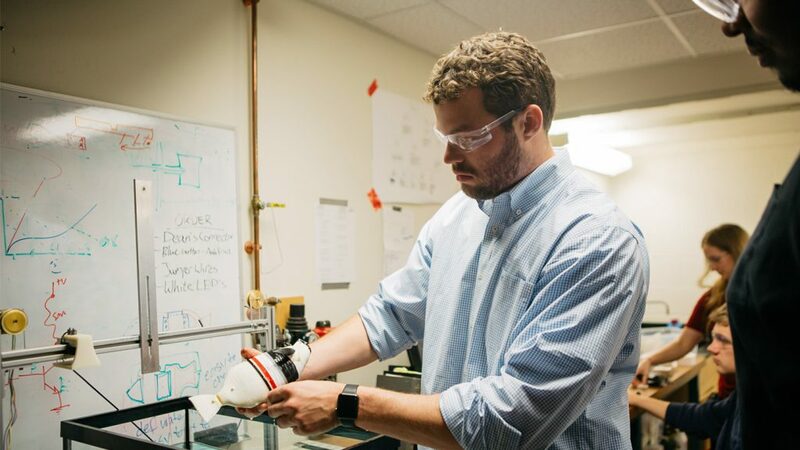 The mechanical engineering senior design course was enhanced through the X-Trained Engineering initiative funded by the Kern Entrepreneurial Engineering Network. Faculty received a stipend to develop experiences that foster thinking beyond the technical challenges of a problem and to consider its humanistic, artistic, economic, and social dimensions.